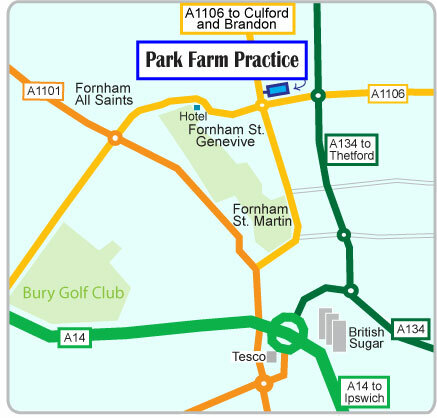 From the A14 – Take the Tesco’s/British Sugar exit from the A14 and follow the signs to Thetford A134. This takes you to a roundabout, take the first exit, left onto the A134. At the second roundabout go straight over, at the third roundabout take the first exit left, off the A134. Follow this road to the roundabout where you go right (third exit) signed to Culford/Brandon. 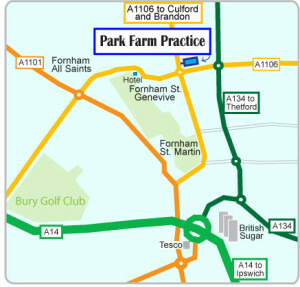 Park Farm Business Centre is immediately on your right, there is a pond by the road. Please drive in and park in the first car park on your right. We are opposite this area. From Central Bury – Go towards Tollgate, take the A1101 towards Culford. At the roundabout in Fornham St Genevieve go straight over and then immediately turn right into Park Farm Business centre. There is a pond by the road. Please drive in and park in the first car park on your right, we are directly opposite.